The fact is, we are really good at cost-effective tree removals. For the record, we are experts with tree pruning. We have trained and preserved thousands of trees in the time we have been in business. 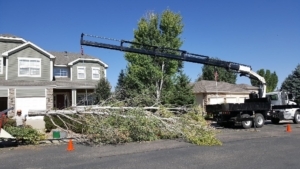 The nature of any tree service business is to provide both tree removal and tree pruning. The sad story is; Boulder County has a lot of demand for tree removals. Therefore, we invested to meet our customer’s needs. We invested in a 38 ton knuckle boom crane to keep up with the heavy demand for tree removals. We even started a new complementary business, called Scorpion Crane Service. 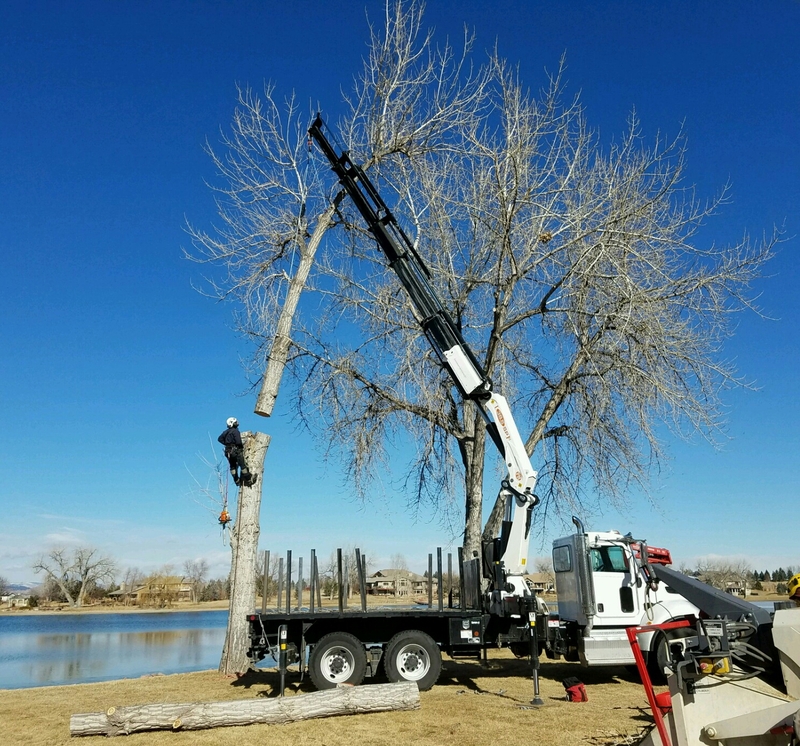 This crane service primarily assists Parker Tree Service, yet helps other local tree services with tree removal and log disposal. Wait; what? You need a crane to remove trees? Certainly not all tree removals require a crane! Certainly we are experienced and skilled to dismantle trees without a crane. However, when a job site permits us to use our crane, we use it to stay competitive and reduce risk to property. The crane we have at our service is wireless remote controlled and it can help us move 2,000lb tree branches, effortlessly. (It isn’t uncommon to extract 3,000lb – 4,000lb branches from a tree). We cut out portions of the tree then place them right behind our wood chipper for processing. Whatever doesn’t fit through our large 24″ capacity chipper, we load it into the bed of our crane. We repeat this simple process until the tree removal is done. This method reduces the cost to the customer because of the huge reduction of time/labor involved to remove trees. In my career, I have conducted and project managed, at least 700 crane assisted tree removals and “rigged off” several thousand tree limbs. 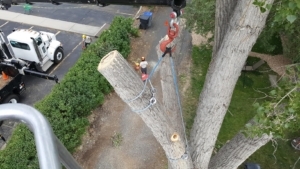 I can assure you, crane assisted tree removals provide the most control, safety, and reduced cost for residential tree removals. We are competitive with pricing because we are equipped with the right machinery and methods. (If you like macho machinery, read below). This provides a feed rate of nearly 1 foot, per 2 seconds. We can process 3,000 pound tree limbs in about 20 minutes. 22 cubic yard chip truck (dump truck). Most competitor’s have a 11-14 cubic yard truck which means for less efficient operations due to the need to leave the job site to dump, during operations. Our large capacity chip truck means we can do several jobs or one large job, in a day. We do not pass on the cost to dump a truck, multiple times per day. We have access to our own crane. This gives the ability to reduce the overall cost by omitting another crane company (sub-contractor) to assist with a project. Our knuckle boom truck is 50% lighter than a traditional “boom truck” style crane, which means less impact on turf or concrete. When necessary, we lay down 3/4″ pressure treated plywood under the tires, to prevent imprinting into a lawn. Knuckle boom cranes are the future of tree removals in our industry. 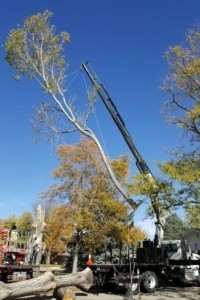 We are one of the few tree removal services, in the Front Range, who owns such a crane. 55′ telescopic & articulated aerial lift truck, which is 40% lighter than our competitor’s. Again, we are about light impact to the surroundings, so our aerial lift truck is one of a kind in the Front Range. The telescopic feature of our aerial lift allows us to set up and work in areas conventional aerial lift are limited to.